1. Butterweck, Böckers, Korte, Wittkowski, Winterhoff – Long-term effects of St. John's wort and hypericin on monoamine levels in rat hypothalamus and hippocampus. Hypericum perforatum L. (St. John’s wort) is one of the leading psychotherapeutic phytomedicines and, because of this, great effort has been devoted to clarifying its mechanism of action. Chronic effects of St. John’s wort and hypericin, one of its major active compounds, on regional brain amine metabolism have not been reported yet. We used a high-performance liquid chromatography system to examine the effects of short-term (2 weeks) and long-term (8 weeks) administration of imipramine, Hypericum extract or hypericin on regional levels of serotonin (5-HT), norepinephrine, dopamine and their metabolites in the rat brain. We focused our interest on the hypothalamus and hippocampus, as these brain regions are thought to be involved in antidepressant drug action. Imipramine (15 mg/kg, p.o. ), Hypericum extract (500 mg/kg, p.o. ), and hypericin (0.2 mg/kg, p.o.) given daily for 8 weeks significantly increased 5-HT levels in the hypothalamus (P<0.05). The 5-HT turnover was significantly lowered in both brain regions after 8 weeks of daily treatment with the Hypericum extract (both P<0.05). Consistent changes in catecholamine levels were only detected in hypothalamic tissues after long-term treatment. Comparable to imipramine, Hypericum extract as well as hypericin significantly decreased 3,4-dihydroxyphenylacetic acid and homovanillic acid levels in the hypothalamus (P<0.01). Our data clearly show that long-term, but not short-term administration of St. John’s wort and its active constituent hypericin modify levels of neurotransmitters in brain regions involved in the pathophysiology of depression. 2. Butterweck V – Mechanism of action of St John's wort in depression : what is known? Extracts of Hypericum perforatum L. (St John’s wort) are now successfully competing for status as a standard antidepressant therapy. Because of this, great effort has been devoted to identifying the active antidepressant compounds in the extract. From a phytochemical point of view, St John’s wort is one of the best-investigated medicinal plants. A series of bioactive compounds has been detected in the crude material, namely flavonol derivatives, biflavones, proanthocyanidines, xanthones, phloroglucinols and naphthodianthrones. Although St John’s wort has been subjected to extensive scientific studies in the last decade, there are still many open questions about its pharmacology and mechanism of action. Initial biochemical studies reported that St John’s wort is only a weak inhibitor of monoamine oxidase-A and -B activity but that it inhibits the synaptosomal uptake of serotonin, dopamine and noradrenaline (norepinephrine) with approximately equal affinity. However, other in vitro binding assays carried out using St John’s wort extract demonstrated significant affinity for adenosine, GABA(A), GABA(B) and glutamate receptors. In vivo St John’s wort extract leads to a downregulation of beta-adrenergic receptors and an upregulation of serotonin 5-HT(2) receptors in the rat frontal cortex and causes changes in neurotransmitter concentrations in brain areas that are implicated in depression. In studies using the rat forced swimming test, an animal model of depression, St John’s wort extracts induced a significant reduction of immobility. In other experimental models of depression, including acute and chronic forms of escape deficit induced by stressors, St John’s wort extract was shown to protect rats from the consequences of unavoidable stress. Recent neuroendocrine studies suggest that St John’s wort is involved in the regulation of genes that control hypothalamic-pituitary-adrenal axis function. With regard to the antidepressant effects of St John’s wort extract, many of the pharmacological activities appear to be attributable to the naphthodianthrone hypericin, the phloroglucinol derivative hyperforin and several flavonoids. This review integrates new findings of possible mechanisms that may underlie the antidepressant action of St John’s wort and its active constituents with a large body of existing literature. To the Editor: Dr Shelton and colleagues1 concluded that “St John’s wort was not effective for treatment of major depression.” These authors may have been overly skeptical in interpreting their data. In the intent-to-treat analysis, according to the study’s response criterion, 26.5% of subjects receiving St John’s wort vs 18.6% of patients in the placebo group responded to treatment (P = .15), and according to the study’s remission criterion, 14.3% vs 4.9% showed remission (P = .02). If one evaluates this trial in the context of other similar studies, it is noteworthy that the comparisons of St John’s wort vs placebo in this study is in the same direction as studies with a positive outcome, although it does not reach statistical significance. What is surprising about these data is the low response rate to placebo. A placebo response of 20% to 30% is routine in studies of depression.2 Thus, an equally reasonable conclusion is that St John’s wort was perhaps better than placebo in the treatment of major depression. A third arm with an established antidepressant might have resolved these difficulties. 4. Gaster , Holroyd J. – St John's wort for depression: a systematic review. To address whether St John’s wort is useful for the treatment of depression we attempted to retrieve all English-language articles with data on the efficacy, safety, and availability of St John’s wort. Randomized, controlled, double-blind trials were selected and assessed for methodological quality using a standardized checklist, and data on pharmacology, cost, regulation, and safety were extracted. Eight studies were identified, found to be of generally good methodological quality, and determined to provide a modest amount of data to suggest that St John’s wort is more effective than placebo in the treatment of mild to moderate depression. The absolute increased response rate with the use of St John’s wort ranged from 23% to 55% higher than with placebo, but ranged from 6% to 18% lower compared with tricyclic antidepressants. More data are required to assess both its use in severe depression and its efficacy compared with other antidepressants. Rates of side effects were low. 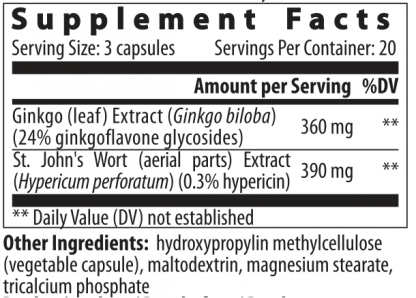 As a dietary supplement, St John’s wort is currently largely unregulated, but the Food and Drug Administration is reviewing plans to tighten its regulatory oversight. 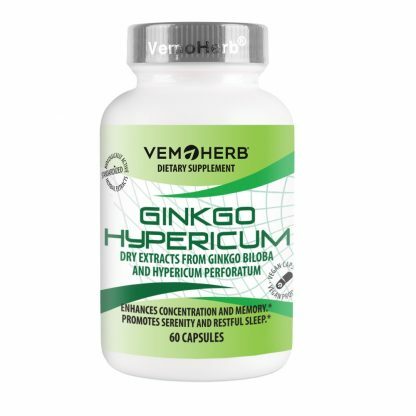 Ginkgo biloba is among the most favourite and best explored herbal drugs. Standardized extracts of Ginkgo biloba represent the only herbal alternative to synthetic antidementia drugs in the therapy of cognitive decline and Alzheimer’s diseases. The clinical efficiency of such standardized Ginkgo biloba extracts (GBE) is still controversial, but authors of numerous international clinical studies recommended the use of GBE in the described therapies.Extracts of Ginkgo biloba are a mixture of substances with a wide variety of physical and chemical properties and activities. Numerous pharmacological investigations lead to the conclusion that the terpene trilactones (TTL) and the flavonoids of GBE are responsible for the main pharmacological effects of the extract in the therapy of cognitive decline. Therefore, the quality of GBE products must be oriented on a defined quantity of TTL and flavonoids. Furthermore, because of their toxic potential the amount of ginkgolic acid should be less than 5 ppm.However, data on pharmacokinetics and bioavailability, especially related to the central nervous system (CNS), which is the target tissue, are relatively rare. A few investigations characterize the TTL and flavonoids of Ginkgo biloba pharmacokinetically in plasma and in the brain. Recent investigations show that significant levels of TTL and Ginkgo biloba flavonoids cross the blood-brain barrier and enter the CNS of rats after oral application of GBE. Knowledge about the pharmacokinetic behaviour of these substances is necessary to discuss the pharmacological results on a more realistic basis. 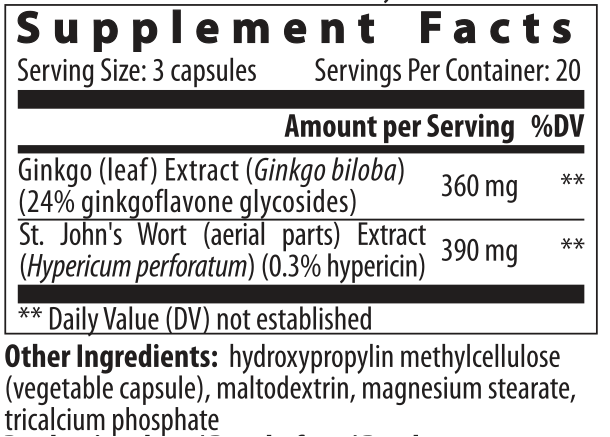 (PDF) Ginkgo biloba Extracts: A Review of the Pharmacokinetics of the Active Ingredients. 6. Zhang SJ1, Xue ZY. – Effect of Western medicine therapy assisted by Ginkgo biloba tablet on vascular cognitive impairment of none dementia. 7. Santos, Galduróz, Barbieri, Castiglioni, Ytaya, Bueno – Cognitive performance, SPECT, and blood viscosity in elderly non-demented people using Ginkgo biloba. Alzheimer’s disease (AD) is the most common neurodegenerative disorder to date. Neuropathological hallmarks are β-amyloid (Aβ) plaques and neurofibrillary tangles, but the inflammatory process has a fundamental role in the pathogenesis of AD. Inflammatory components related to AD neuroinflammation include brain cells such as microglia and astrocytes, the complement system, as well as cytokines and chemokines. Cytokines play a key role in inflammatory and anti-inflammatory processes in AD. An important factor in the onset of inflammatory process is the overexpression of interleukin (IL)-1, which produces many reactions in a vicious circle that cause dysfunction and neuronal death. Other important cytokines in neuroinflammation are IL-6 and tumor necrosis factor (TNF)-α. By contrast, other cytokines such as IL-1 receptor antagonist (IL-1ra), IL-4, IL-10, and transforming growth factor (TGF)-β can suppress both proinflammatory cytokine production and their action, subsequently protecting the brain. It has been observed in epidemiological studies that treatment with nonsteroidal anti-inflammatory drugs (NSAIDs) decreases the risk for developing AD. Unfortunately, clinical trials of NSAIDs in AD patients have not been very fruitful. Proinflammatory responses may be countered through polyphenols. Supplementation of these natural compounds may provide a new therapeutic line of approach to this brain disorder. 10. Yoshitake, Yoshitake, Kehr – The Ginkgo biloba extract EGb 761(R) and its main constituent flavonoids and ginkgolides increase extracellular dopamine levels in the rat prefrontal cortex. 12. Kennedy, Scholey, Wesnes – Modulation of cognition and mood following administration of single doses of Ginkgo biloba, ginseng, and a ginkgo/ginseng combination to healthy young adults. 14. Hemmeter, Annen, Bischof, Brüderlin, Hatzinger, Rose, Holsboer-Trachsler. – Polysomnographic effects of adjuvant ginkgo biloba therapy in patients with major depression medicated with trimipramine. 15. Woelk H1, Arnoldt KH, Kieser M, Hoerr R. – Ginkgo biloba special extract EGb 761 in generalized anxiety disorder and adjustment disorder with anxious mood: a randomized, double-blind, placebo-controlled trial. 16. Müller, Rolli, Schäfer, Hafner – Effects of hypericum extract (LI 160) in biochemical models of antidepressant activity. Since the mechanism of the antidepressant activity of hypericum extract is not yet understood, we tested possible effects of standardized hypericum extract (LI 160) in several biochemical models relevant for the mechanism of action of other antidepressant drugs. While LI 160 was only a weak inhibitor of MAO-A and MAO-B activity, it inhibited the synaptosomal uptake of serotonin, dopamine and norepinephrine with about equal affinity-2 micrograms/ml). Moreover, subchronic treatment of rats with hypericum extract led to a significant down-regulation of beta-receptors and to a significant up-regulation of 5-HT2-receptors in the frontal cortex. The data might suggest that hypericum extract acts via similar biochemical mechanisms to other antidepressants (e.g. tricyclics). 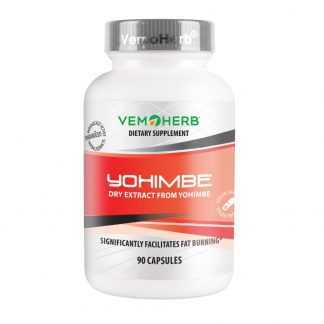 I am very very satisfied with that natural product produced by VEMOHERB. 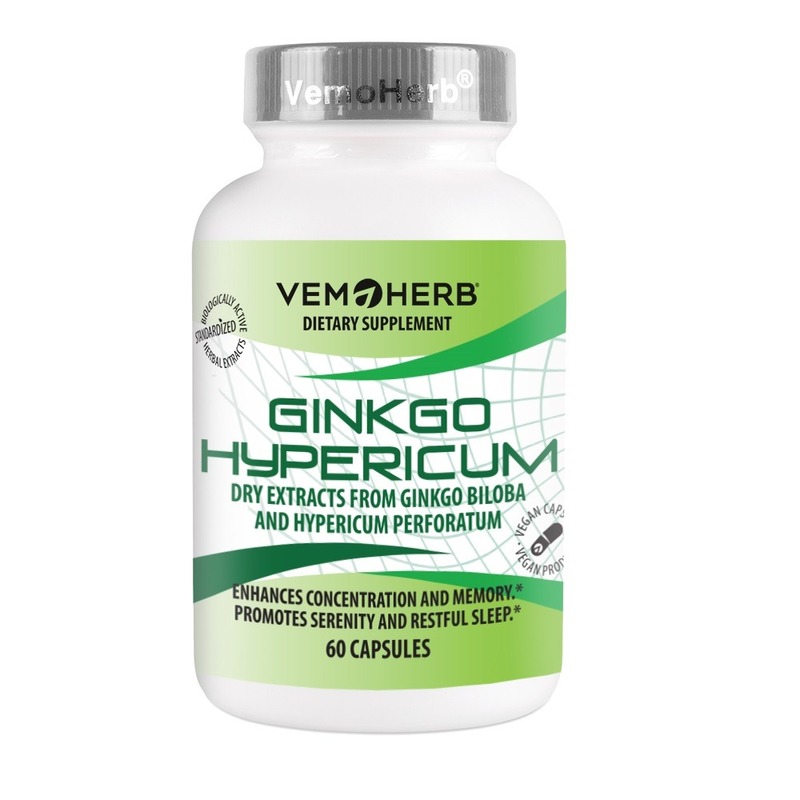 It helped me a lot during my exams, Gynkgo Hypericum stimulated my brain in a way i can’t even imagine before, improved my memory significantly. I want to praise this product because I was very pleased with it. This seems an excellent quality of Ginkgo by VEMOHERB. I feel more alert and know when I don’t take it. I’ve ordered over three bottles already and can trust this brand! My memory has improved greatly through taking this everyday, three times a day for 6 months. As a new 50-year-old student memory is very essential for this old boy. Thank you!